N.b. When students miss assessments due to legitimate causes (which are verified through means such as doctor’s certificates), you need to leave their mark blank in the markbook until just before their reports are due and then create their estimates on all the tasks up until that point (so the estimate doesn’t appear on the portal). This needs to happen once before half yearly reports and again before yearly reports! 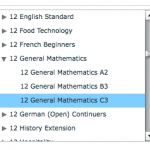 You can use Edumate to generate estimates for a student based on a subset of tasks from the same course. 2. From the column in the left, choose the appropriate class. 3. When your class is highlighted in blue after clicking it, click on ‘show marks’ to view the marks for the class. 4. Click on the magnifying glass (circled in red below) for the task you need to make an estimate for. 5. 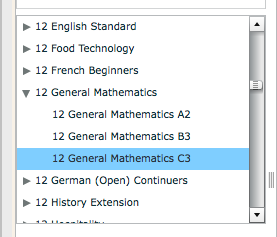 For the student you need to estimate, locate the empty box under the ‘qualifier’ column (should be one of the far right columns), then click the arrow in that empty box (circled in red below). Then click ‘Estimate’ (circled in orange below) from the menu that appears. 6. 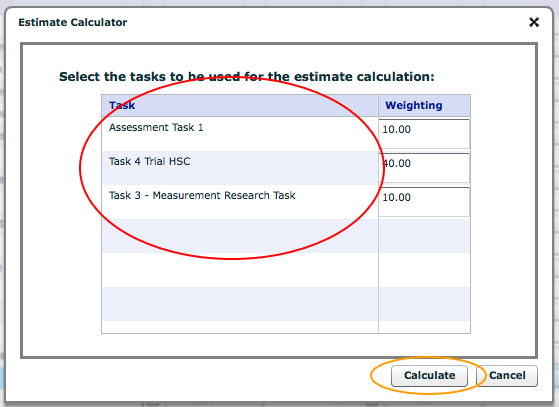 Click on ‘Calculated’ to generate an automatic estimate based on certain tasks. 7. You will see a list of the other tasks in the same class/course. Select multiple tasks to include in the estimate by holding down the ‘ctrl’ key on your keyboard (or on mac ‘command’ key), then clicking each of the tasks you would like included in the estimate (circled in red below), the tasks you select will be highlighted blue (do not release the ctrl/command key until you have clicked on all tasks you want – only tasks highlighted in blue will be included). Finally click on the ‘Calculate’ button (circled in orange below). 8. 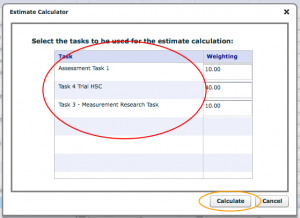 An estimate based on the students marks in the tasks selected will be calculated. Remember to click the ‘Save’ button when you are finished.